The primary inspiration for most of this product line lies with the Vidyadhara, Chögyam Trungpa, Rinpoche. Although I was a competent and experienced professional seamstress when I met him in 1974, he encouraged me to use my talent and skill to reproduce traditional Tibetan practice materials. I worked with him and with His Holiness, the Sixteenth Gyalwa Karmapa, until their deaths, and have continued to develop these products for the Shambhala Community, and Sakyong, Mipham Rinpoche, since then. I now offer them to you for the enhancement of your personal practice. Although many of the individual products are traditional (béré, chevrons, chöppön cloths, to name a few), several have been developed in response to demands of Western lay practitioners to accommodate particular liturgies, home shrines and developing Buddhist and Shambhala traditions, like Childrens Day. The Sadhana (pecha) Covers, as well as the Commentary Covers fit practice books printed for the Shambhala sangha. The Zen Cover was designed to fit the Daily Sutras used by Eido Roshis students, and the Double Book Wrap came into being for small liturgies produced for students of Chokyi Nyima, Rinpoche and Khenpo Tsultrim Gyamtso, Rinpoche. If you do not see what you need for your practice, consider contacting me about a possible design  especially if there are others in your sangha with similar needs. Investing in appropriate and beautiful practice materials is a luxury you will not regret. Many of the traditional items I make and offer here are also made in India and Nepal, and imported to Europe and North America. You can certainly find similar practice materials for less. But you will not find better quality. In the early summer of 1980, while His Holiness, the 16th Gyalwa Karmapa was visiting Boulder, Colorado, I had the good fortune to be his personal seamstress. One morning he called me into his sitting room at Marpa House and showed me three small coloured pencil sketches of a flag. He told me (through a translator) that he had dreamed that wherever this flag was flown, the Dharma would flourish. He asked me to make one. I sketched out on graph paper what I thought represented the complete symmetry of his drawings and confirmed my representation with him before proceeding to enlarge my pattern to accommodate a full-size flag. 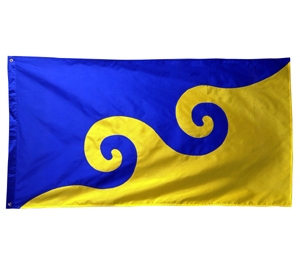 The first Dream Flag was raised on Midsummers Day. The Dharma has been flourishing ever since. Click here to read more about Deborah Luscomb.